Now available in bookstores and on line! 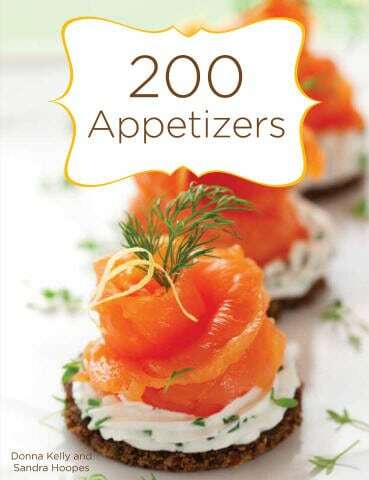 We put 200 of our favorite appetizers together in one book just in time for the party season. There are plenty of our signature Southwest and Grill recipes along with East Meets West, Updated Classics, Mediterranean Favorites, Holiday Recipes and many, many more. Small in size… big on flavor! 200 of our appetizers, hors d’oeuvres, canapes, morsels, and small bites. Don’t look at appetizers as just pre-dinner teasers any longer. With a wide variety of tasty and easy recipes including updated classics such as Sweet Potato Skins and Saucy Meatball Lollipops, you can dip and spread your way through to a complete meal. An appetizer by any other name be it hor d’oeuvres, canape, tidbit, or morsel, is still the yummiest way to tease your taste buds prior to the main course event. However, with 200 Appetizers, and an offering of recipes such as Shrimp Topped Avocado Mousse, Apricot Pistachio Phyllo Purses, Savory Rugalach, Mad Greek Dip, or Mongolian Meatballs, you may want to skip dinner and let the finger food fill you up. Get your copy in time for holiday parties and tailgating season! Prices vary from $10.18 to $12.99 (plus shipping) depending on your choice of vendor. Sandra Hoopes recently graduated from culinary school with an added pastry certificate. She enjoys taking cooking classes from great chefs in Phoenix, Santa Fe and at the Culinary Institute of America in Hyde Park, New York. Sandra is has been the Lifestyle and Foods Editor for the Puma Press in Phoenix.